Unlimited access to our experts. Audicus sat down with Ashlee Holland, founder of the “Love, Ashlee Rose” boutique. Ashlee was born deaf and has used her art skills and business savvy to launch an online business that creates beautiful apparel and accessories that promote hearing loss and deaf awareness. Ashlee’s designs center around acceptance of hearing devices and hearing loss. Ashlee also donates a portion of the proceeds from her clothing sales to schools of deaf education. Read the full interview below and check out her shop here! Can you tell me a little about yourself, your life and family? Certainly! First off, I would like to thank you for giving me the opportunity to share with others a little about myself and my business. I was born profoundly deaf to a hearing family in a small town in Vermont. My hearing loss was diagnosed at age 10 months. After extensive research and seeing many specialists, my parents chose an oral approach. I wore large hearing aids and worked with a teacher of the deaf for speech and language development three times a week. When I was in high school, I chose and was approved for a cochlear implant. In college, I took ASL classes. I have experienced many barriers to education, but I believe it made me more determined. In 2009, I became a single mother to a hearing daughter. She is my biggest blessing! My family has been very supportive and encouraging through my life and in my business. They are my biggest cheerleaders. Can you share what your own experience with hearing loss has been and how it informed your work? It is a daily challenge every day with my hearing loss. I have learned to compensate in many ways. I studied Art and Graphic Design in College. It was my hearing loss that has inspired my designs. 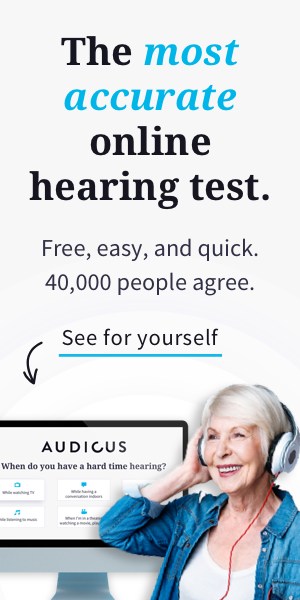 I recognize that people with a hearing loss have choices. Today, hearing aids have improved, cochlear implants are common. and sign language is an international language. Children are now diagnosed at birth due to laws implemented. I want my designs to be used for dialogue regarding hearing loss. Deaf and hard of hearing awareness and education is my goal. What have you learned working as an aide at an oral approach deaf school and how has that informed your work online and the causes you support? I enjoy being a teacher aide working with the hardest workers: the students. It brings me memories of my childhood, and it’s very comforting to be with the children as we wear the same pair of shoes. I understand what they are going through. I may not understand what the parents go through, but I understand the parenting since I am a mother as well. We want the best for our children. This led me to create shirts for families to support their individual journey. The t-shirts you design are so positive; what inspired the collection and what has the response been? My job, my daughter, and family have been a huge influence on who I am and inspired me to start “Love, Ashlee Rose.” I want the shirts to be positive for the families, children, Deaf Education teachers, audiologists, and speech pathologists to love their journey, to feel loved and to feel accepted. It is not easy, but it is a gift and it should be used in a positive way to spread their story and deaf awareness. It is humbling to read emails from the community loving the shirts and it is rewarding to see pictures of children and adults shining for who they are and what they do wearing my shirts. Can we expect more Deaf Awareness Apparel and what can we look forward to from your business? Absolutely! I have seasonal projects going throughout the year for all different devices and ways to express their story! It is really exciting! You also write on your site about raising awareness of the challenges facing the Deaf and Hard of Hearing communities. What challenges might people not be aware of? The initial shock and devastation of the diagnosis for the family is so hard. Then the journey, research, and hard decisions to make regarding their child. The steps of deciding which type of education, type of communication, and devices are sometimes overwhelming decisions to make. Research and opinions can be conflicting. Deaf education and financial support is not always available. My family moved from Vermont to Boston to give me a great education. I had to learn to advocate for myself as I got older and research resources. Socializing with my friends and co-workers in noisy surroundings is still a challenge for me where I rely on lip reading. What would you want people to understand better about individuals who are Deaf or Hard of Hearing? We all have different types of hearing loss and different ways of communication. We may be different, but we are not different from hearing people in so many ways. We go through the same life events, learning, working, heartbreaks, marriage, and parenting. We are the same but different! I still appreciate people facing me, so I can lipread, repeating if necessary, and their patience! Are there any activists, writers, or artists (aside from yourself!) that you recommend readers explore to learn more about Deaf and Hard of Hearing experiences, issues, projects, etc? I also enjoy following families and bloggers and those that share their story on Instagram. Hear the World Foundation sponsored by Cindy Crawford and several other celebrities in another website I follow. We are not alone! Is there anything else you’d like to share that we haven’t asked about? I feel blessed to have had the opportunity to share my shirt designs in an effort to start the conversation about hearing loss and to share 10% of my profits for Deaf Education. I appreciate your interest in my business, my goals, and inspirations. All fields required, your email address will not be published.